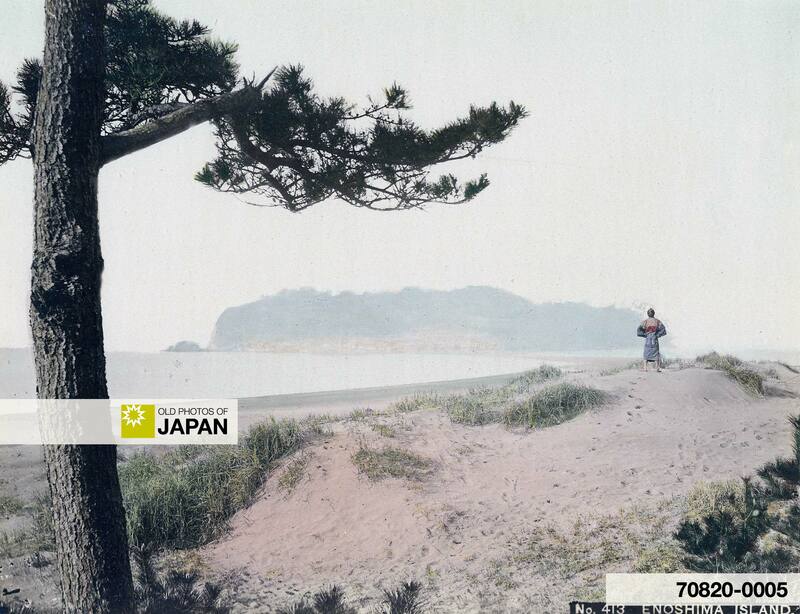 The island of Enoshima in Sagami Bay, Kanagawa Prefecture as seen from the dunes on shore. A reach of sand stretching from the beach to the island can be seen to the left of the man with his back to the camera. The tiny island with a circumference of just 4 km was connected to the mainland during low tide, but could only be reached by boat during high tide. On the left of the island the small island of Shotenjima can be seen. The Great Kanto Earthquake of 1923 (Taisho 12) made land around the island rise so much that the two islands ended up being connected. And our path turns sharply to the right, and winds along cliff-summits overlooking a broad beach of dun-coloured sand; and the sea wind blows deliciously with a sweet saline scent, urging the lungs to fill themselves to the very utmost; and far away before me, I perceive a beautiful high green mass, an island foliage-covered, rising out of the water about a quarter of a mile from the mainland, Enoshima, the holy island, sacred to the goddess of the sea, the goddess of beauty. I can already distinguish a tiny town, grey-sprinkling its steep slope. Evidently it can be reached today on foot, for the tide is out, and has left bare a long broad reach of sand, extending to it, from the opposite village which we are approaching, like a causeway. Unfortunately, the island’s increasing popularity probably helped to persuade the local people to build a bridge. Enoshima’s first bridge was built in 1897 (Meiji 30). People were levied 3 sen in tolls to cross and return. In 1930 (Showa 5), Kanagawa Prefecture took over the bridge and lowered the toll to 2 sen. In 1949 (Showa 24), a new concrete bridge was built, the tolls were now 5 yen. This was changed to a ferro-concrete bridge in 1958 (Showa 33). In 1964 (Showa 39), the island was linked by a massive concrete bridge to accommodate modern traffic, accompanied by lots of development on the island itself. By then, all of Enoshima’s once enchanting charm was completely lost. The beautiful dunes of this photograph have been completely erased by concrete buildings and asphalt roads, one of the countless victims of uncontrolled development. 1 Hearn, Lafcadio (1910). Glimpses of unfamiliar Japan. Bernhard Tauchnitz, 57-59. You can also licence this image online: 70820-0005 @ MeijiShowa.com.